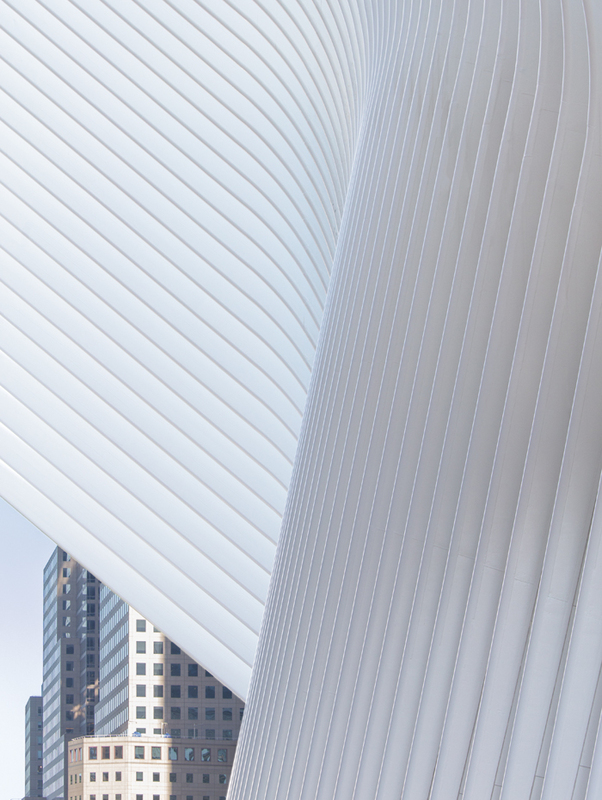 Inspired by a dove being released from the hands of a child, Santiago Calatrava’s transit hub at the World Trade Center features a pair of white steel-ribbed wings soaring 50m into the sky. Delayed and more than twice its original budget, at over $4bn, it is an astonishing Instagrammable spectacle, but will time heal the cost to New Yorkers? When his City of Arts and Sciences, a sprawling complex of bright-white, zoomorphic buildings in his hometown of Valencia, was denounced as so expensive that it threatened to bankrupt the province, Santiago Calatrava lashed out at his critics, saying: 'They are not attacking the Alhambra in Granada. They are not attacking the Prado in Madrid.' When his transit hub at New York's World Trade Center started going off the financial rails - eventually costing an astonishing $4bn, more than twice its original budget - he took the same tack. 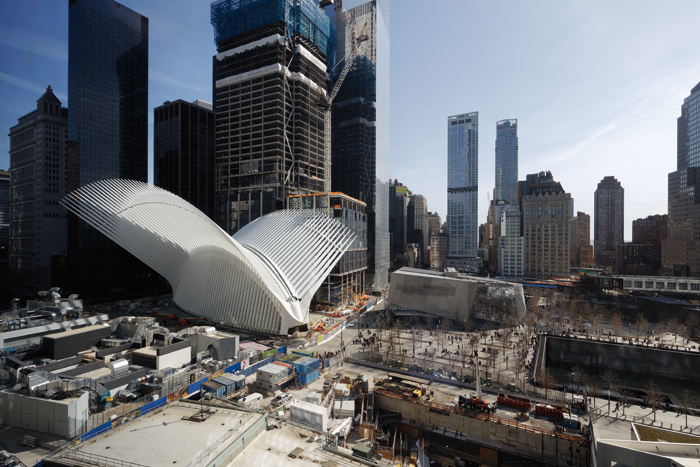 No one remembers what Grand Central Terminal cost, Calatrava insisted, comparing his creation to a building that has been loved for generations. Arrogant? Perhaps, but also true. 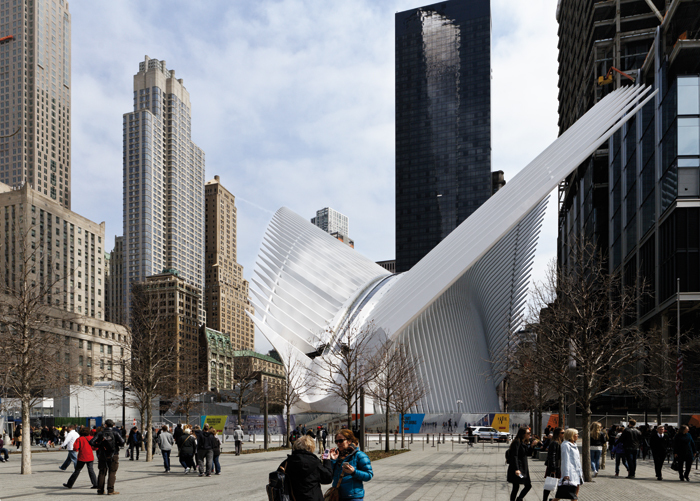 Calatrava's hub - which centres on a giant oval room, 100m long and 30m wide, topped by a pair of steel wings soaring 50m into the sky - is a crowd-pleaser the likes of which New York hasn't seen in generations. It is likely to become the symbol of Ground Zero, easier to capture in a photo than the memorial fountains outside, or the ungainly 1 World Trade Center (née Freedom Tower) a bit further west. It has been called a selfie-magnet, Instagram-bait. 'At last an inspiring public building. It's now my secular cathedral. Hallelujah,' the restaurateur Florent Morellet posted on Facebook, echoing thousands of others. And when a large entrance directly from the street opens later this year the giant room, called the Oculus, part of which is still behind construction barricades, will be both more accessible and more dramatic. Normally unflappable, New Yorkers will be 'oohing' and 'aahing'. 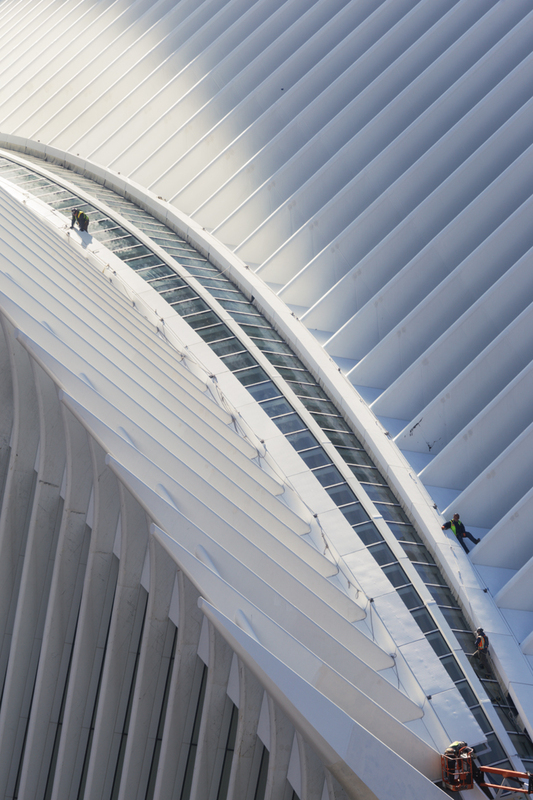 Calatrava's work tends to expose the divide between the architecture establishment and 'ordinary people', between those who intellectualise architecture, many of whom are openly disdainful of Calatrava, and those who just want to enjoy it. So, steel it was. But local fire codes require that structural steel be covered in an intumescent paint, which when exposed to heat expands, providing insulation and emitting moisture. Unfortunately, the coating gives a cottage-cheesy texture to much of the structure. And unlike the hoped-for concrete, which would have been naturally pale, the steel needed to be painted white, a vast job that was completed at the last minute, and not particularly well. 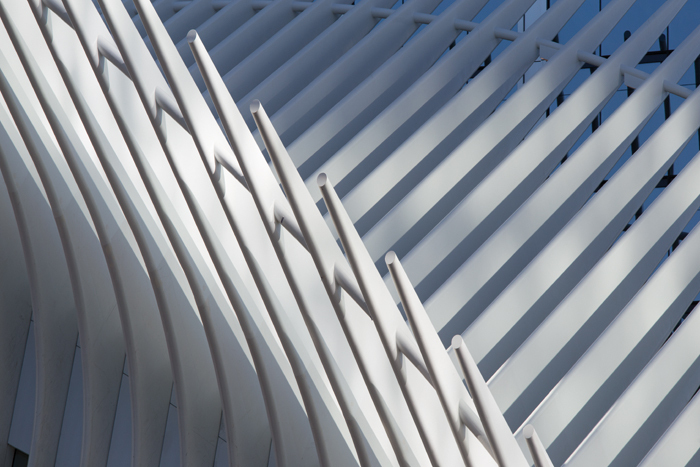 Calatrava's buildings are all about repetition of details, and large imperfections distract from the overall effect. Security concerns at Ground Zero - apart from stopping the Port Authority releasing plans or drawings - meant the steel ribs of the above-ground portion of the Oculus had to be thicker and deeper than in Calatrava's original design - so much so that the ribs largely obscure views through the glass panes overhead. The roof doesn't feel like a glass surface supported by steel ribs so much as a steel surface with thin glass insets. That said, the small amount of sky visible overhead will be diminished anyway, when two new buildings rise just north of the Oculus - the World Trade Center Performing Arts Center (by Joshua Prince- Ramus of REX) and the 415m-tall 2 World Trade Center (by Bjarke Ingels of BIG). The view, like so many views in New York, will be of neighbouring buildings. Grand Central Terminal, built 115 years ago, helped spark development of an entire section of Manhattan. 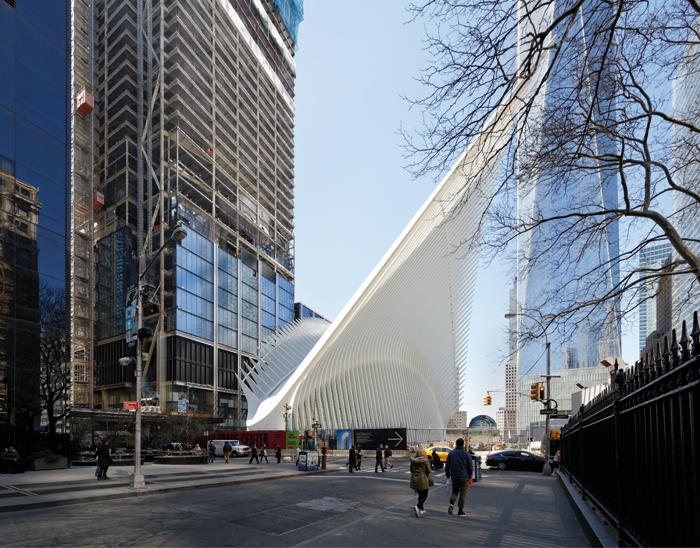 Calatrava's station, by contrast, can't do much to help the already jam-packed financial district of Lower Manhattan, which - to everyone's surprise - has boomed to the point of bursting since September 2001. And of course Grand Central is truly a hub, connecting interstate and commuter rails with half a dozen subway lines. Its vast central hall is criss-crossed by people going somewhere, not merely posing for pictures. 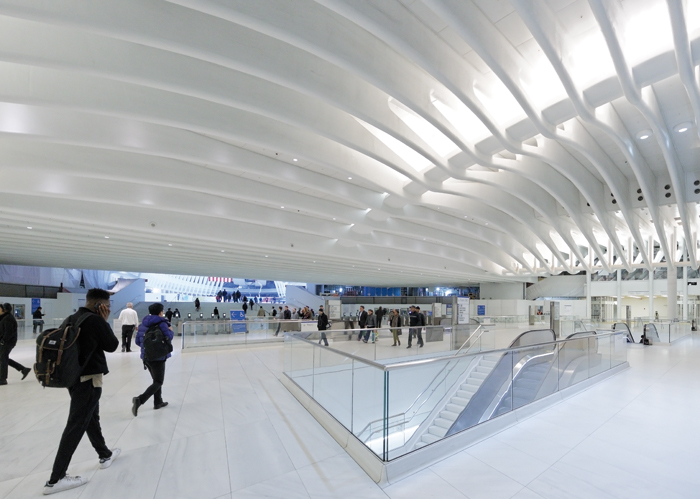 By contrast, Calatrava's station is largely an empty room, an add-on to a terminus for trains that cross the Hudson River from New Jersey. These trains serve a modest 50,000 commuters a day, compared to Grand Central's 750,000 daily riders. Service on the so-called PATH lines hasn't been significantly expanded in decades, and even now the platforms on which commuters wait are oddly narrow (which the Port Authority source says was 'dictated by the alignment of the tracks, which is very restricted, just as it was pre-9/11'). The Oculus, in other words, is a large bauble on a very frail finger. But the city wanted a bauble, and Calatrava was ready to provide it. At the press conference announcing the project in 2005, he released two pigeons (portrayed at the time as doves) into the air, promising that his station would be a symbol of peace and - continuing the bird metaphor - would have wings that flapped up and down at the touch of a button. The flapping was eliminated as too expensive. What was left was stationary (except for an overhead window that can open) - somewhat more like a dodo than a dove. Or is it a brontosaurus? Or the ribs of the old World Trade Center towers, revisited as a vast public sculpture? Calatrava has said he is remaking architecture as 'an abstract, figurative art'. And his buildings tend to support multiple interpretations. In 2003, the architect unveiled his Auditorio de Tenerife (in Spain's Canary Islands), with a wing-like canopy that rises almost 80m before swooping back to earth. Some saw the canopy as a crescent moon, some a wave crashing against Tenerife's shore, some a seashell, others as a gull's wing, still others as the volcano at the centre of the island. Reviewing the building, I wrote positively of that ambiguity, which if nothing else had people talking about architecture. 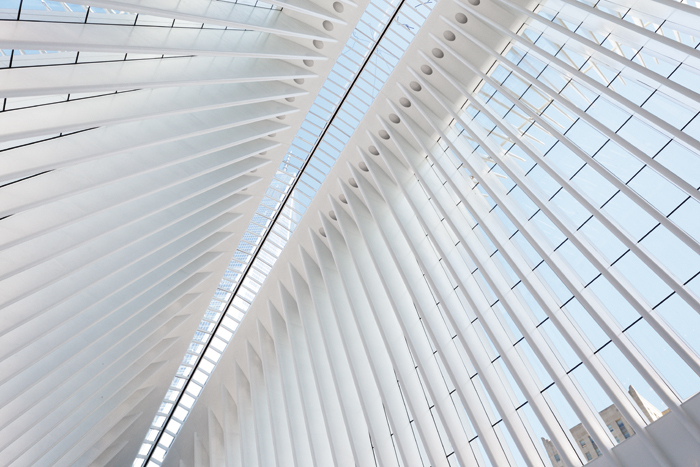 But other critics saw the wide range of interpretations as a sign that Calatrava was undisciplined, unwilling or unable to avoid a clash of symbols. There is one thing the Oculus resembles for sure, his Milwaukee Art Museum's Quadracci Pavilion (2001), a smaller space with a ribbed glass roof that can be opened to the elements. That project, too, went far over budget, but is now beloved by Milwaukeeans. 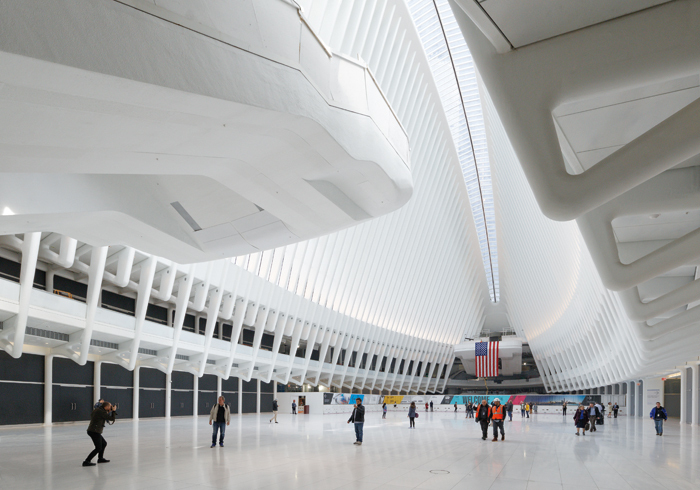 The Oculus is also reminiscent of the shapes of the Valencia complex, and pretty much every other high-budget Calatrava building of the past two decades. And Calatrava's forms aren't derivative only of Calatrava. They are, in large part, descended from Antoni Gaudí, whose experiments with catenary curves are precursors of Calatrava's, and Pier Luigi Nervi, the Italian engineer known for expressing structural elements as almost surreally fluid concrete forms. Not coincidentally, Nervi's most zoomorphic building is an underutilised, and under-appreciated, bus terminal at the George Washington Bridge, about 10 miles north of the new transit hub, and also owned by the Port Authority, which Calatrava says he has explored from every angle. Calatrava's home, a lavish Park Avenue townhouse, is equidistant between Nervi's station and his own. Calatrava's work at Ground Zero also owes a debt to the Finnish-American architect Eero Saarinen - it's as if the Oculus combines the bird-like forms of Saarinen's TWA Terminal at John F Kennedy Airport, and the graceful ribs that hold up the roof of his Dulles Airport outside Washington DC. Another apparent influence is the Japanese-American architect Minoru Yamasaki. Yamasaki, of course, was the designer of the original World Trade Center towers, whose shortcoming - too many ribs for too little glass - Calatrava repeats. New York's mass-transit infrastructure is woefully inadequate, and there is nothing in the pipeline that will change that -- certainly nothing to compare with London's 118km-long Crossrail system. A subway line beneath Manhattan's Second Avenue, under discussion for a century and under construction for a decade, is a mere 33 blocks long. Even Calatrava's fans wonder what real transit improvements $4bn could have bought. 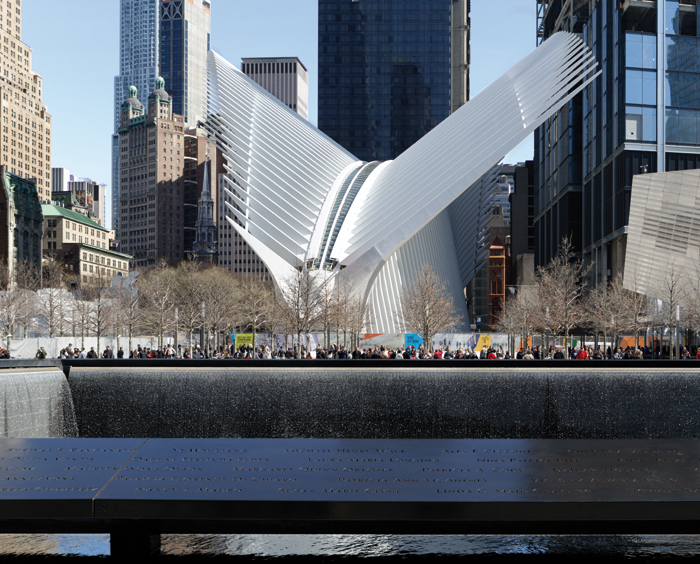 Calatrava may be right that nobody will remember the cost of his station. But they may well wonder what might have been, even as they stare up in amazement.